2015 was called a record-breaking year for social media sites. Every year, almost 200 million people sign up, and by the end of 2016, we are expected to be north of two billion social media users (Inc. Magazine). It is no wonder that social media has the complete attention of marketers across the globe. 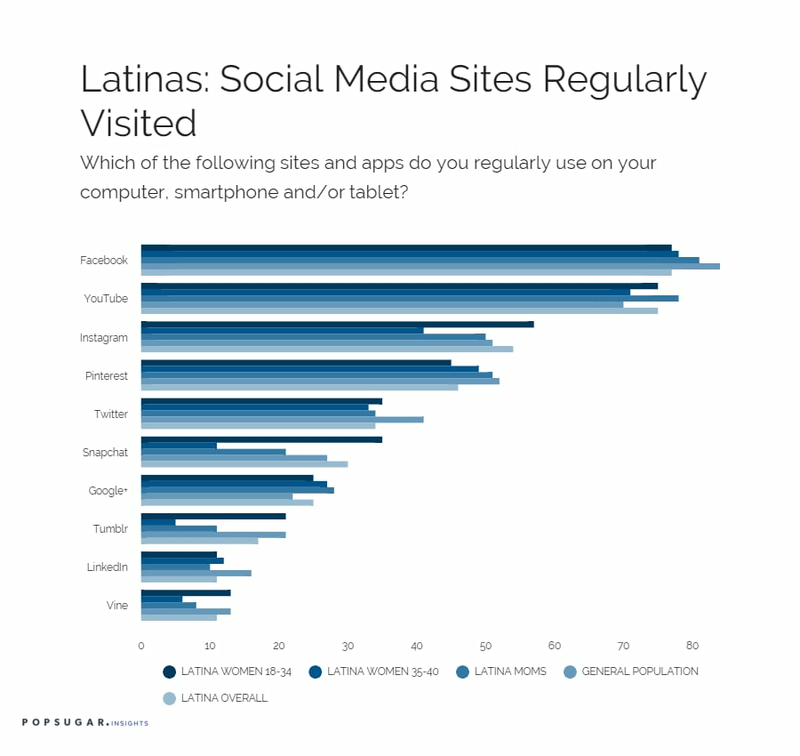 But, if marketers want to efficiently market to Latinas using social media, they might be surprised to find that Latinas favorite social media sites differ from the general population and by demographic. In our POPSUGAR Insights 2015 Hypercultural Latina study we found that Latinas favorite social media sites and/or apps they regularly use are Facebook (77%), YouTube (75%), and Instagram (54%). Social sites they don't visit regularly are Vine (11%), LinkedIn (11%), and Tumblr (17%). Pinterest (46%), Twitter (34%), Snapchat (30%), and Google+ (25%) fall in the middle. In comparison to the general population, Latinas are more inclined to regularly visit YouTube, Instagram, and Snapchat and less inclined to use Facebook, Pinterest, and Twitter. When breaking down the demographics, we learned that Latina moms use Facebook, YouTube, and Pinterest more regularly than Latinas overall. Millennial Latinas prefer Instagram, Snapchat, and Tumblr. Older Latinas (age 35-40) are not as social as their younger counterparts or Latina moms, with the exception of Facebook (78%) and YouTube (71%), with all other social media sites falling under the 50% range.